Anyway… so Gluten Free Stuff That I Ate on Vacation in the Florida Keys. 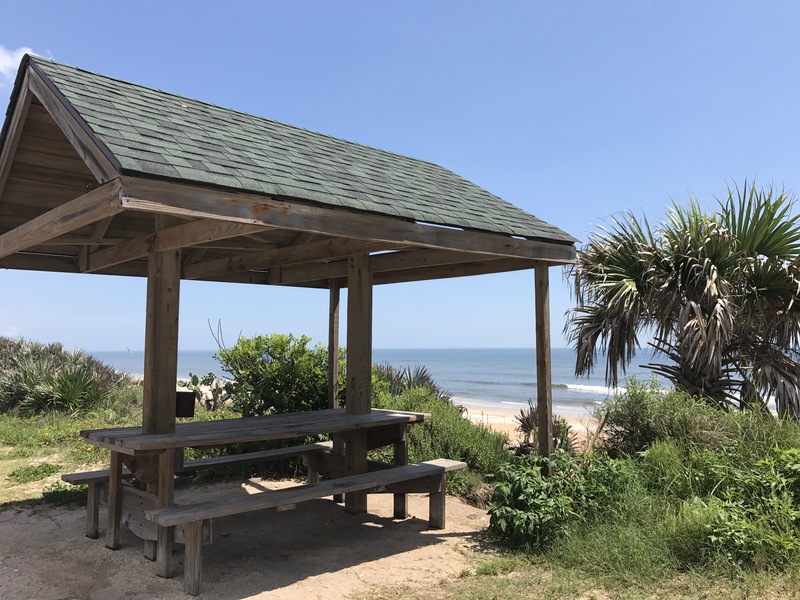 The first day as we drove down the A1A (between St Augustine and the first Keys) we stopped for a picnic lunch along the beach. (Because there are sandy beaches along that stretch, but not IN the Keys.) We’re back on track with our much healither GF lunches… lunch meat, nuts, fruit and water. It’s easy to pack, way healthier, lower carb and travels nicely in the small cooler. Thank heavens for the Find Me Gluten Free App. I don’t know how any GF person can survive without it! FMGF was filled with recommendations all throughout the Keys. 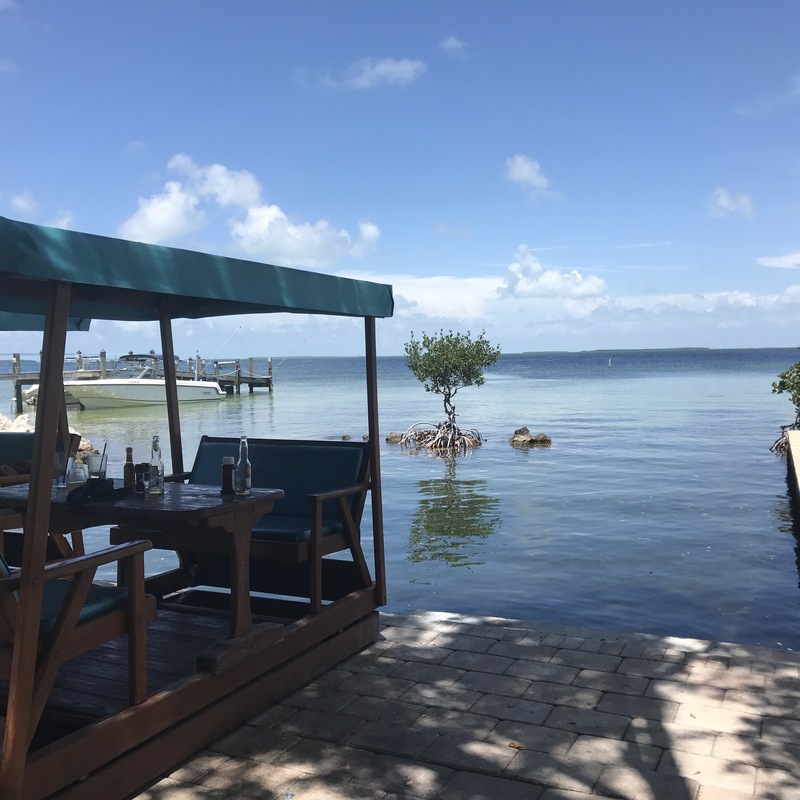 For lunch we stopped at Marker 88 in Key Largo. They had good reviews on FMGF and the sales guy from the Visitor Center gave us a card for 10% off. 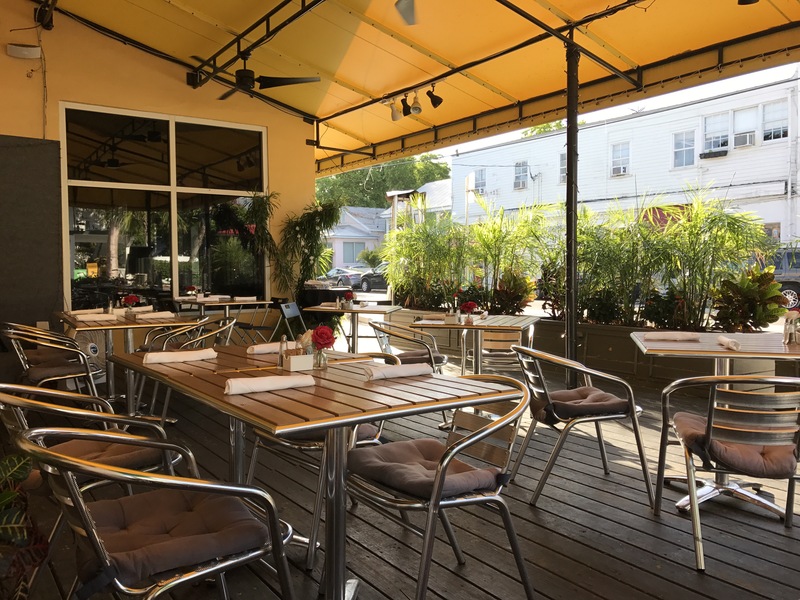 The food was really good and the staff was polite and helpful with ordering GF safely. They had a separate GF menu and I appreciated that the GF menu was posted on their website. It’s nice to see what’s available before you get to the restaurant. Brian and I were even able to stay on our Arbonne Detox plan (a little longer). 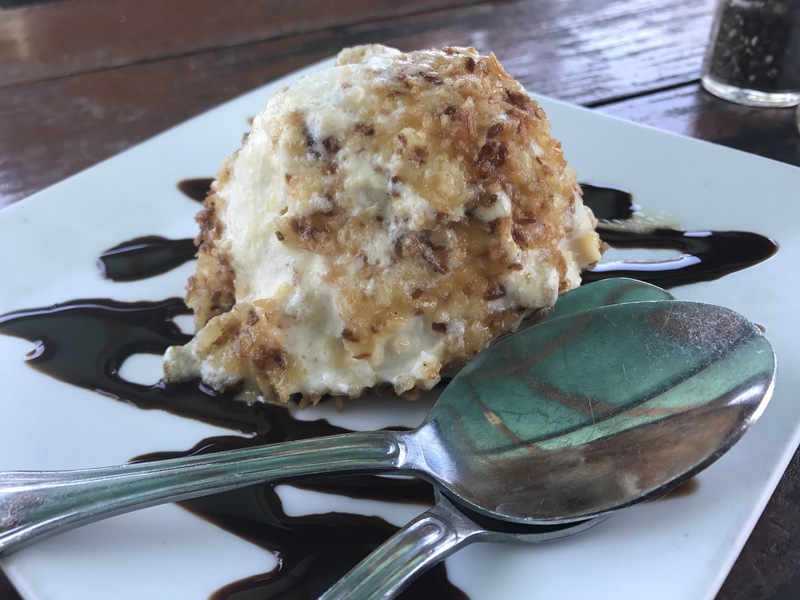 Except for the Coconut Crusted Deep Fried Ice Cream that we shared for dessert…. umm… but I had to order that for you guys, right?! I have a responsibility to my readers! 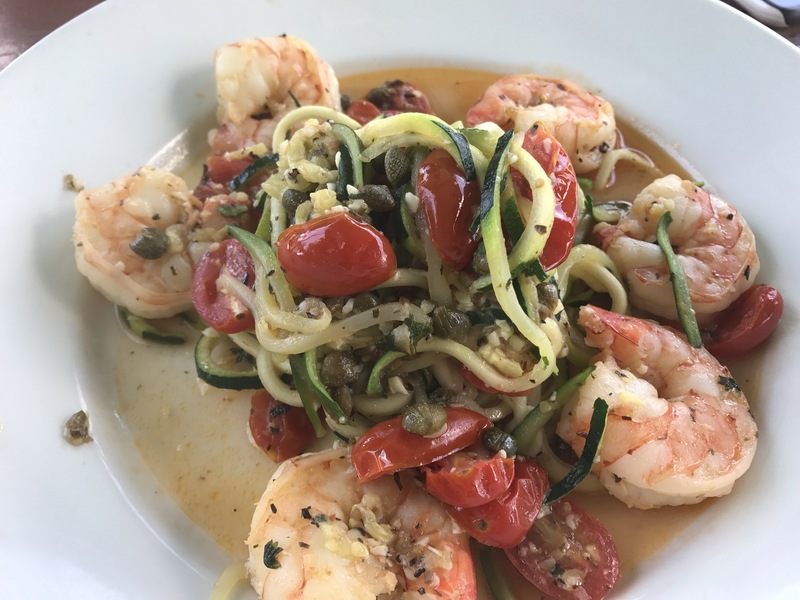 Brian got the Shrimp Zoodles. My mom has been telling me to make zoodles for forever, but I kept resisting… they just didn’t sound yummy…. Mom was right (As usual) the zoodles were delicious! I ordered the Alligator Reef Salad. There’s no alligator in the salad…. but the crab, shrimp and hearts of palm were super yummy. It was served with a Mango Citrus dressing that really complimented the shrimp and crab. The Coconut Fried Key Lime Ice Cream sounded better than it actually was. The coconut crust was good, but the ice cream was super frozen. Obviously it had to be really cold so it could be fried, but it made it really difficult to eat. Brian got the Duck BLT… made with duck bacon. OMG! Sooo good. I got the Lobster Pie. It was good… but also kind of odd, but good…. 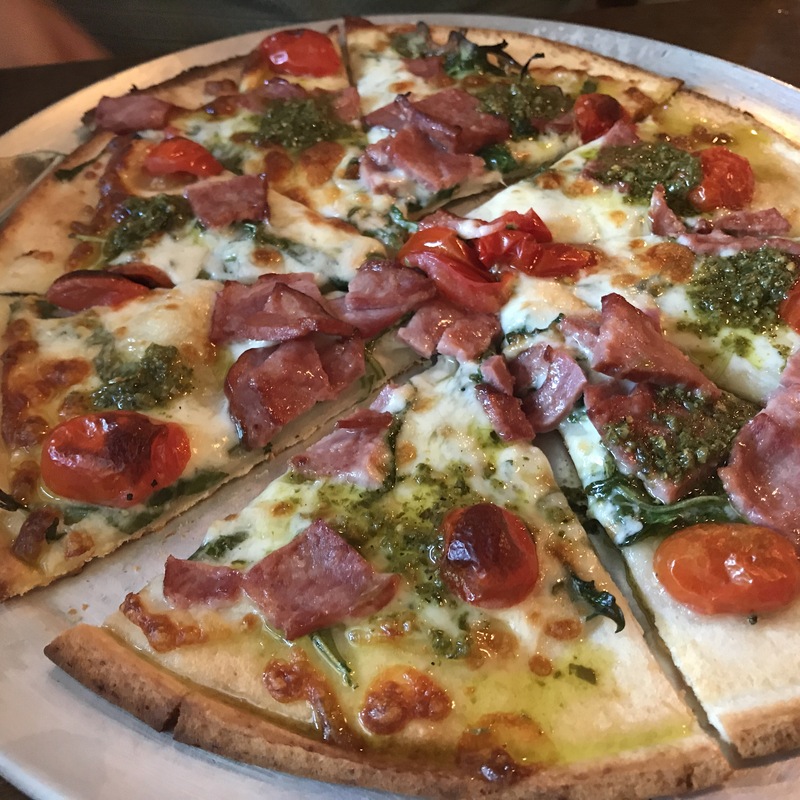 I liked it, but it wasn’t my favorite pizza ever. 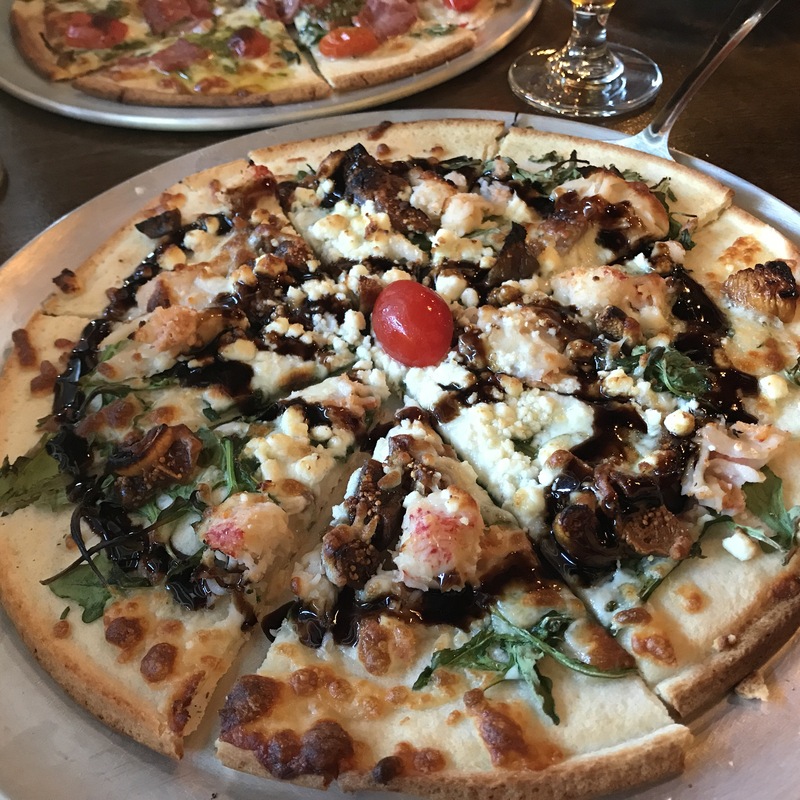 The bits of fig and balsamic vinegar gave it a slightly sweet flavor. Not bad, but I prefer more savory pizzas. The crust was fabulous though! Our waitress brought me a sample of the blueberry cider from Slim Pickens Cider and Mead. (A local brewer!) I’m not normally a big cider drinker, but I couldn’t pass up blueberry. It had a nice berry flavor, but not overly sweet…. crisp. Perfect with pizza. We liked the restaurant so much that Brian and I went back the following morning for breakfast. Brian ordered the GF pancakes. He liked them, but they weren’t my favorite. They were thick and a bit ‘biscuit’ like. 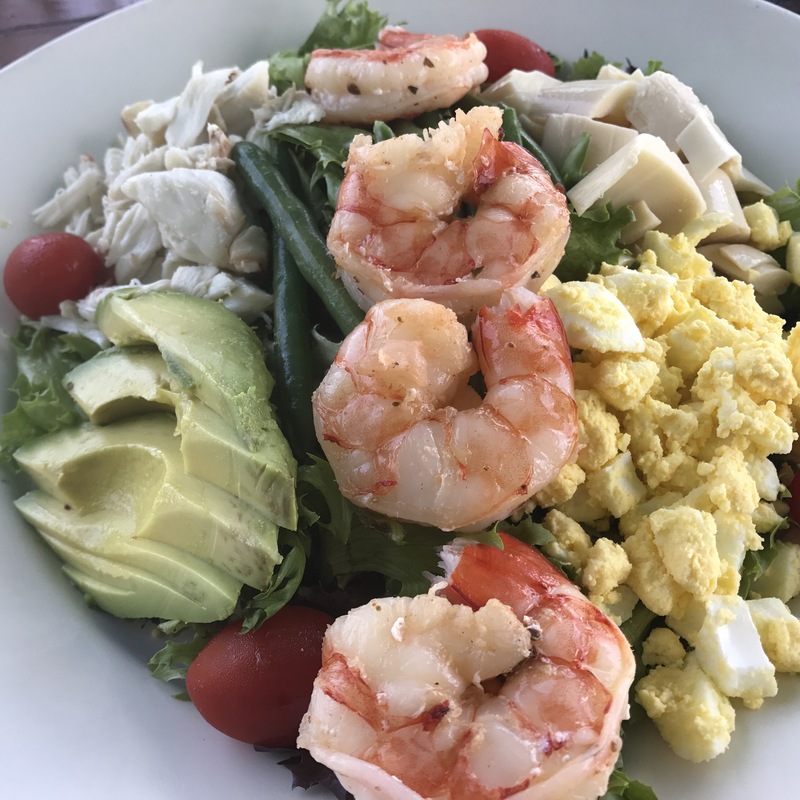 Since we were going out on the Sailboat / Snorkel / Kayacking tour that day I didn’t want to eat anything that might upset my tummy. 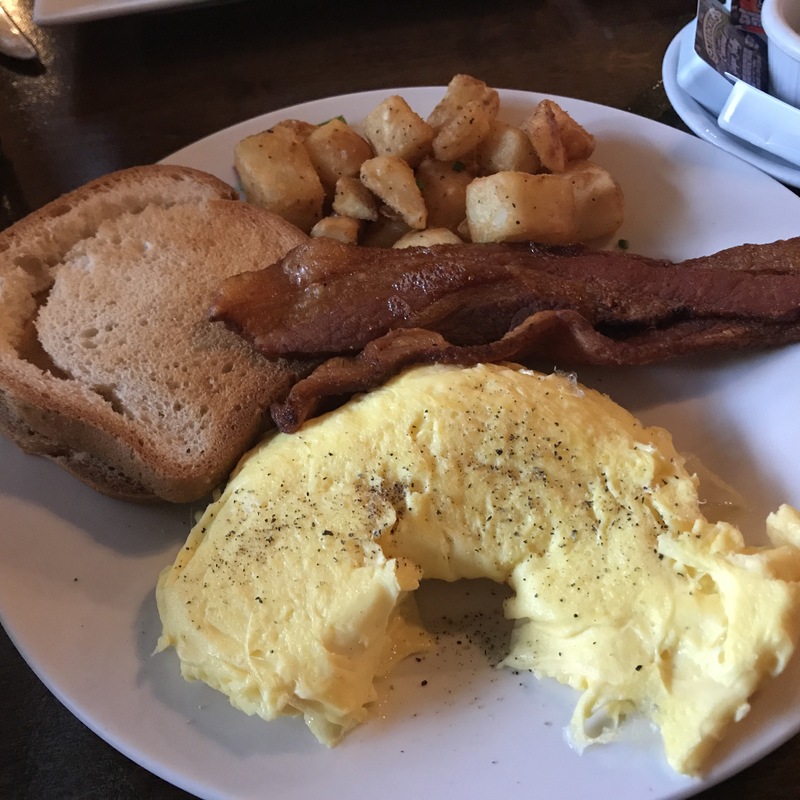 I ordered scrambled eggs and duck bacon with a side of potatoes and gf toast. The waiter was great and told us that the potatoes themselves were gf, but since they’re fried there could be cross contamination… but since we were the first customers that morning and they change their oil every day the potatoes would be safe. I appreciate that he took the extra step to warn me that they were safe this time, but might not be next time. The toast seemed to just be Udi’s… I should have told them to skip the toast, but every once in a while I come across something new and yummy. Word of warning: the restaurant is tiny. Seriously tiny… 18 seats at tables and about 8 at the bar. Make reservations! Brian had been craving BBQ. I argued for Mexican, but I caved when I heard that the BBQ place was closer. I was just ready to eat and then go back to the room and get cleaned up. The waitress gave us a separate GF menu (single sheet of paper). She didn’t seem very knowledgeable about what was GF or not. I asked if the potato salad was safe and she said she thought it should be safe because potatoes are gluten free. Ugh. 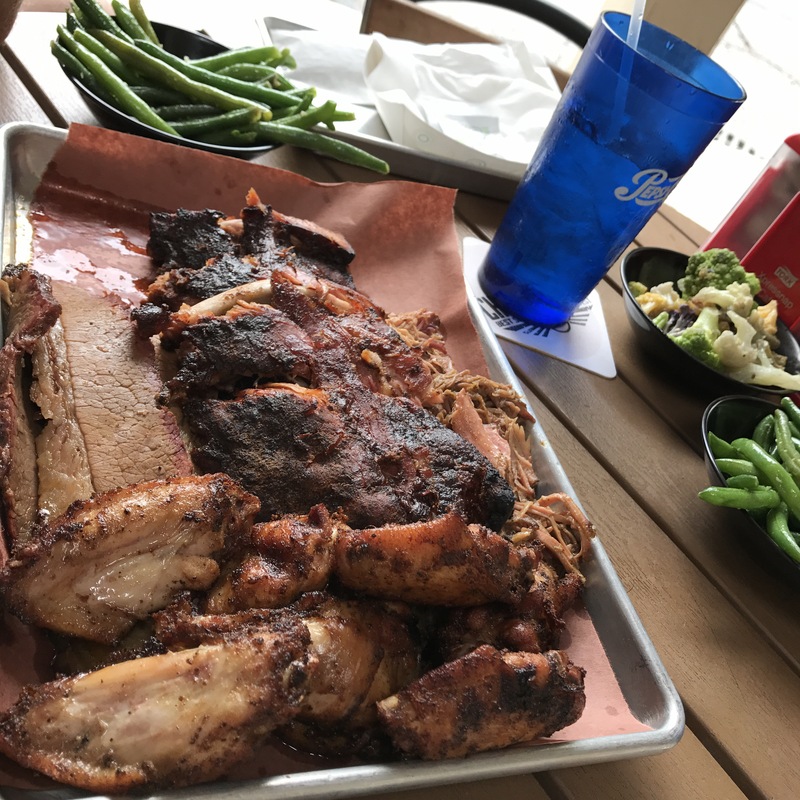 We ordered the BBQ Plate for Two. All of the sauces were Gluten Free and we decided to stick with green beans for our sides since they were listed on the gf menu. The food was good and we didn’t get sick…. I’m not confident that they had the best understanding of GF…. it seems more like the meats and sauces are gf and if you stick to those you’ll be okay. 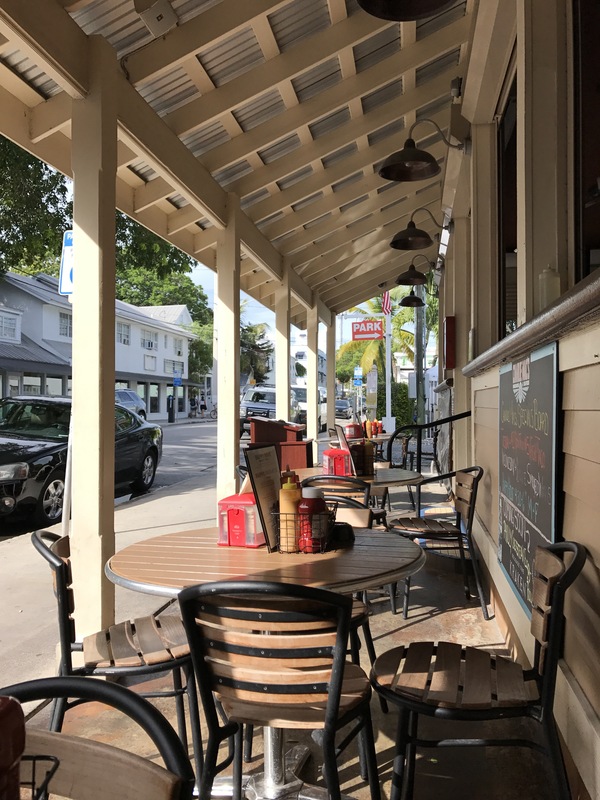 I read some delicious sounding reviews for Le Petit Paris and had insisted that we weren’t leaving Key West until I got to go there for breakfast. 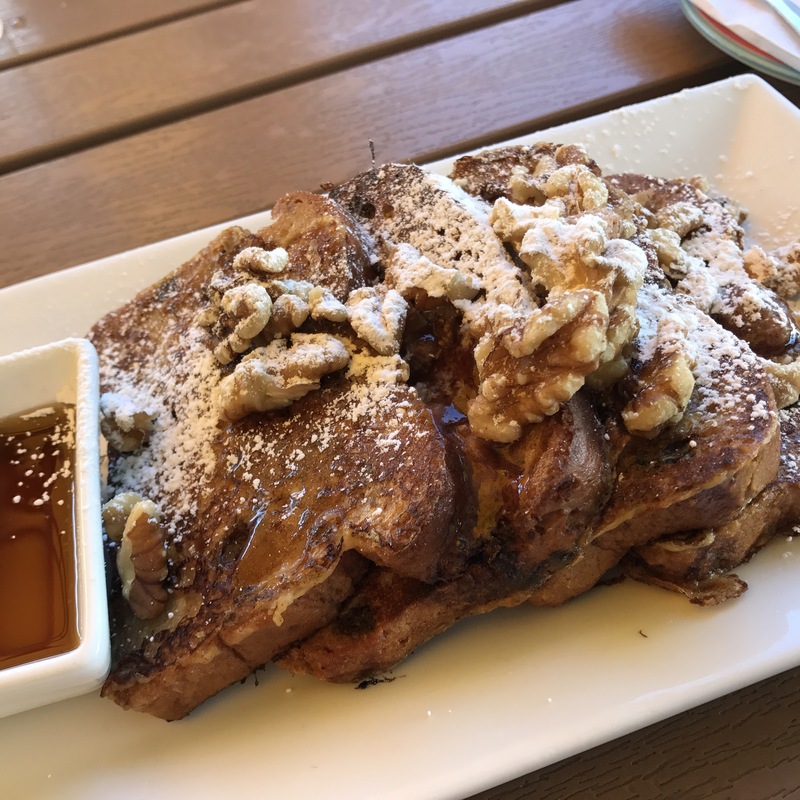 Cinnamon Rasin French Toast with cinnamon butter and walnuts. *gasp* It was syrup coated heaven! I should have asked what brand of bread they used, but I was so busy stuffing every last bite into my mouth I never managed to ask. It was absolutely delish! 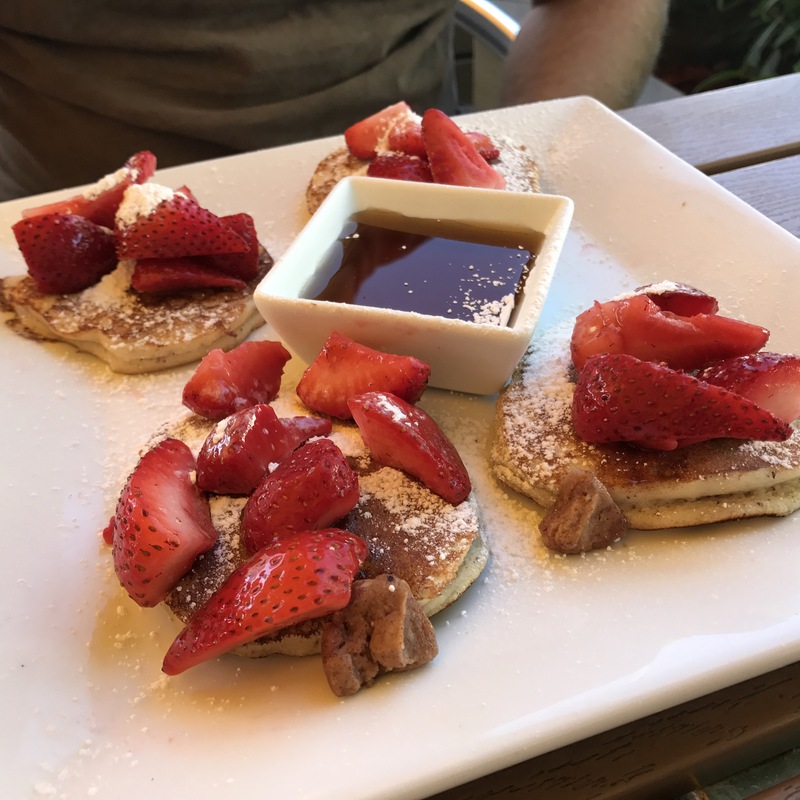 Brian ordered the GF pancakes. They were…. cute? Four very small, strawberry decorated pancakes made up Brian’s breakfast. It was almost comical compared to my heaping plate of French Toast. Fortunately for me, Brian doesn’t like raisins, so I didn’t have to share! Breakfast was not inexpensive. There was a $4 up-charge for all GF orders… which seems a bit steep to me…. but, the food was delicious. So just go in knowing that you’re going to pay an arm and a leg. (It’s worth it though!) The pancakes were $12 and the French Toast was $11 before the extra $4. 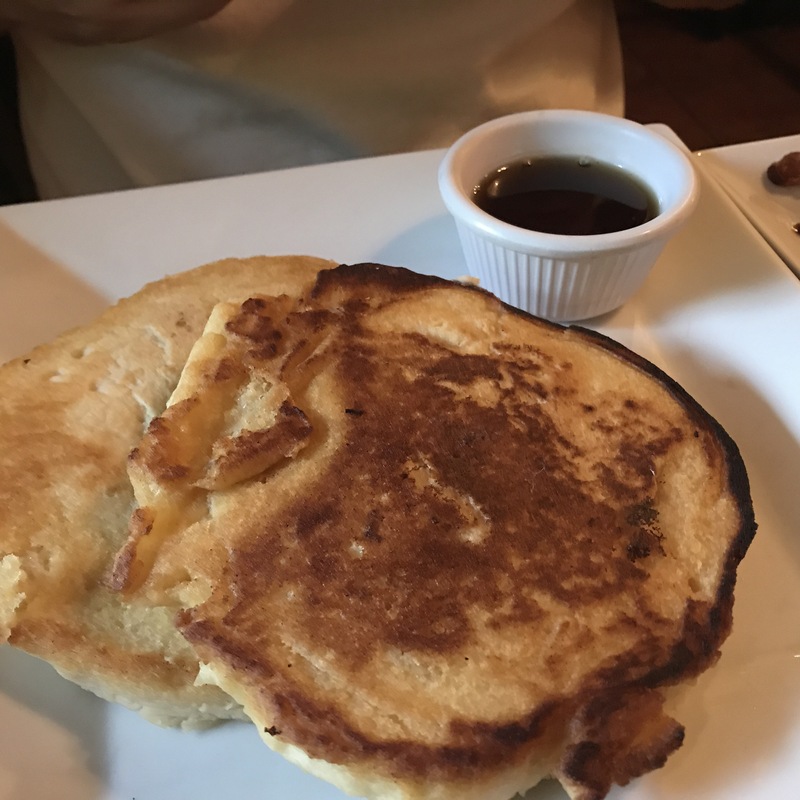 Strangely, my French Toast got the upcharge, but Brian’s pancakes didn’t…. I took a bite of his pancakes and didn’t have any issues, so….